The Nebraska Game and Parks Commission has released a tentative schedule for October rainbow trout stocking in western and central Nebraska waters. Trout fishing is a great way to introduce new anglers, including children, to fishing because simple equipment may be used. A spinning or spin-cast rod and reel with a hook baited with a worm will work well. Add a split shot a couple feet above the hook and a bobber a couple of feet above the split shot. Adjust the levels of the split shot and bobber to change fishing depth. 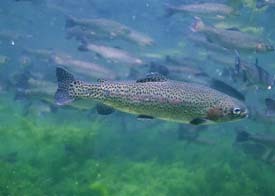 Trout also may be caught with small spinners, salmon eggs, PowerBait and artificial flies. Oct. 11 - Bridgeport State Recreation Area (SRA) northwest lake, 900; Riverside Zoo, Scottsbluff, 900; Morrill middle lake, 450; Morrill south lake, 400; Morrill north lake, 1,450. Oct. 12 - Barnett Park, McCook, 900; Lexington City Lake, 750; Windmill SRA, Gibbon, 2,400; Curtis Golf Course, 150. Oct. 13 - Bridgeport SRA middle lake, 1,000; Grabel Ponds, Fort Robinson State Park (SP), 2,400. Oct. 20 - Holdrege City Lake, 3,000; Birdwood Wildlife Management Area, North Platte, 4,000. Oct. 24 - White River, 250; Carter P. Johnson Lake, Fort Robinson SP, 1,700. Oct. 25 - Humphrey Pond, Ogallala, 900; Lake Ogallala SRA, 6,000. Oct. 27 - Lake Ogallala SRA, 4,000.